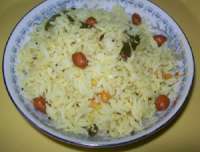 Vangi bhaat is a Karnataka rice recipe. It is a one dish meal and easy to make. It is usually made for a festival meal, for get together, party etc. It may be served at room temperature so is good for parties or for lunch box. The word Marathi word 'vangi' means eggplant/brinjal/aubergine. So most of the times, eggplants are used, but you may also make it with capsicum or peas etc. Add peas along with brinjal or capsicum. 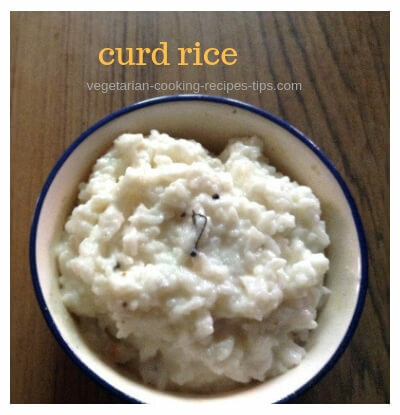 A special spice powder, known as vangi bhaat powder masala is used to make this rice. You may make this masala powder at home or buy it ready as it is easily available. 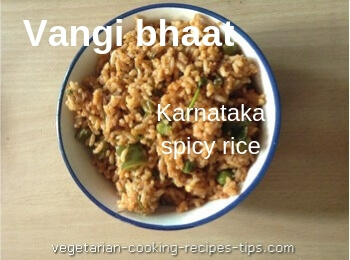 You may make vangi bhaat with fresh rice or with leftover rice. You can make it for any meal, breakfast, lunch or dinner. The cooked rice for this recipe should not be mushy. 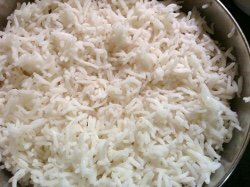 So add a little less water than usual if making with fresh rice. Let the rice cool a bit (so that it does not break while mixing) before adding to the tempering. Use seedless/ less seed eggplant variety if possible. Vangi bhaat masala - 1 to 1 1/2 tbsp, more or less according to taste. Red chili powder - 1/4 tsp, for extra hotness, more or less according to taste. If rice is lumpy, break the lumps using your fingers or a fork. Keep aside. Rice should not be hot. It will break while mixing if it is hot. Heat oil in a kadai / frypan. Add mustard seeds and let them splutter. Add chopped vangi/eggplant and fry for a few seconds. Cover and cook for 2 minutes or till eggplant are just done. Add vangi bhaat powder, red chili powder (if adding), jaggery and salt. Mix well. Take off the flame and keep aside till serving time. Vangi bhaat / spicy tempered rice is ready. Serve it as a meal by itself or with a cucumber or tomato salad and papad. You can see that the basic recipe needs very few ingredients. You may add other chopped vegetables such as potato, fresh green peas. Rice should be at room temperature or cold.